CAPTAIN MAINTAINED - NEW BOTTOM PAINT & PROPSPEED - FULLY WAXED TOP AND HULL - TEAK REFINISHED - COMPLETE GENERATOR & ENGINE SERVICE DONE. This Prestige 500 S (Coupe) is in pristine condition and shows it from every angle! 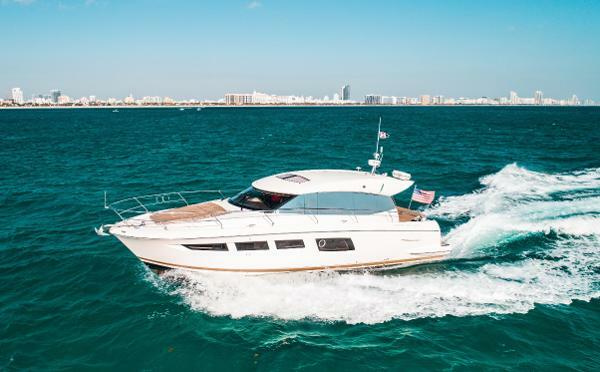 This one owner vessel was designed with large living spaces in combination with one of the most sophisticated and sleek interior floor plans in the market. The vessel features a very private full beam master that is located apart from the rest of the staterooms. 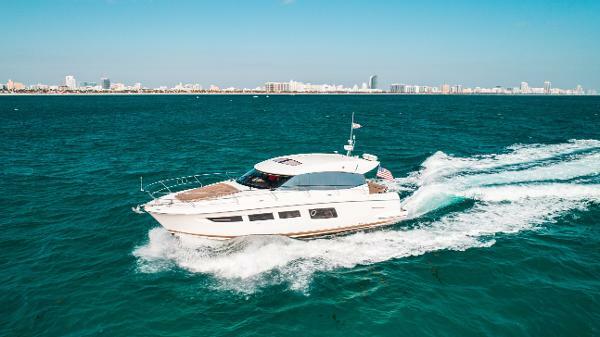 Also features a very open feeling saloon that has been created with a lot of natural lighting coming thru, due to the oversized windows and very convenient retractable hard top. Definitely a very inviting interior to share quality time with friends and family! This 500 S is powered by IPS Volvos 600 that with the addition of a command station in the cockpit makes docking a simple task. Low hours in the engines and even lower in the generator only shows how well this yacht has been kept. Complete engine and generator service just done 2 hours ago as well as proper bottom paint. No need to do bottom paint for another year! 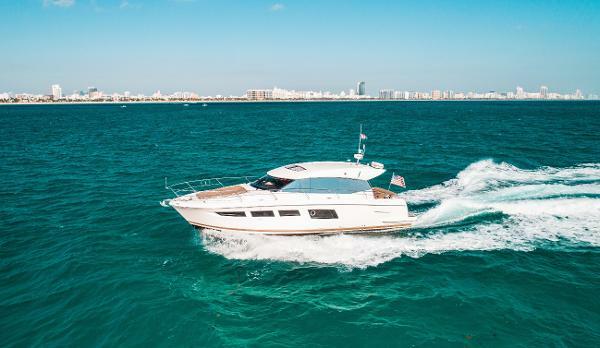 This yacht has been upgraded with a lot options added by a very savvy boater. Please go under full specification to obtain a full list of upgrades (Dinghy, emergency raft, Epirb, electric sure shade, washer/dryer, hydraulic platform, underwater lights, dual GPS and much more! ).This Prestige 500S is the best current opportunity in the market. An authentic Turnkey yacht ready for delivery! Factory Options Include: Electronics Pack - E120W GPS, 4kw Radar, RayMarine Autopilot IPS ST70 Mooring Kit Anchoring Kit Cockpit Protection Cover Launching Ramp for Tender Electric Inflator for Tender Outside Curtains - Wheel House Glendenning Cable Management System Deck Searchlight Under Water Lights Washer/Dryer Combo Air Conditioning (Chiller) - 60,000 Mattress Battens - Master & VIP Cabin Bedspreads Set (3 Cabins) Electric Trim Tabs Engine Control - Cockpit Bose Audio System - AFT Cabin Wood Floor - Salon SAFETY - 6 people Life raft (rooftop mounted). Included safety radio + EPIRB. - 8 Life vests in overhead cockpit storage. -Triple bilge alarm and monitoring panel. -A/C and hot water condensate/overflow monitoring and alarm panel (lights and audible). -CO and smoke monitoring/alarms throughout boat. Co monitor in engine compartment. OPERATIONS - 9 ft. Aluminum Hull AB Rib with 9 HP Yamaha (20 hs.) with anchor and lines. Stored in garage with dedicated rollers/winch. NAVIGATION Raymarine Dual-Screen with Lighthouse Rev. Sirius XM weather Overlay system. Volvo easy connect app based Navigation system. Volvo Interconnect for all system engine data overlay on all systems. All LED bulbs replaced. CONTROL Dual (cabin & cockpit) Joystick drive stations. HANDLING Multiple 5, 15, 25 foot custom 3/4" diameter lines for Medmoor Style docking. 2nd/Backup safety Aluminum anchor with 300 ft line/chain. PROTECTION Cockpit and sunbed seating/lounge pad covers. New 2018. Custom windshield sun cover (black). Cockpit & full wrap window. Carpet saver custom fit floor protection system. On board Vacuum cleaner. COMFORT Teak cockpit table finished and sealed with 3 high end aluminum yacht chairs. Dual AC compressor system for tropical AC heat loads. Complete set for all cabins. Two (2) complete set of bedding for each cabin. Fully equipped Kitchen with utensils, pots/pans, glasses, plates, etc. Custom made additional rail snap on seating (4) for bow area. Full shade canopy for entire bow area. SECURITY Interlock on garage door. IP camera hookup for cockpit monitoring MAINTENANCE Ethernet based engines/thruster/onboard AC/DC charger monitoring system (engine room). Water pressure monitoring gauges on AC coolant-loop (IPS compartment) and main onboard pressure pump. New set of house batteries Full set of printed manuals for all boat components. Spare parts for cooling/drive/lubrication/fuel diesel engines, generator and outboard. (3K value). Spare bulbs and critical electrical components. STORAGE Over Kitchen storage racks bins. Upgraded dual bin larger capacity garbage bins in kitchen.